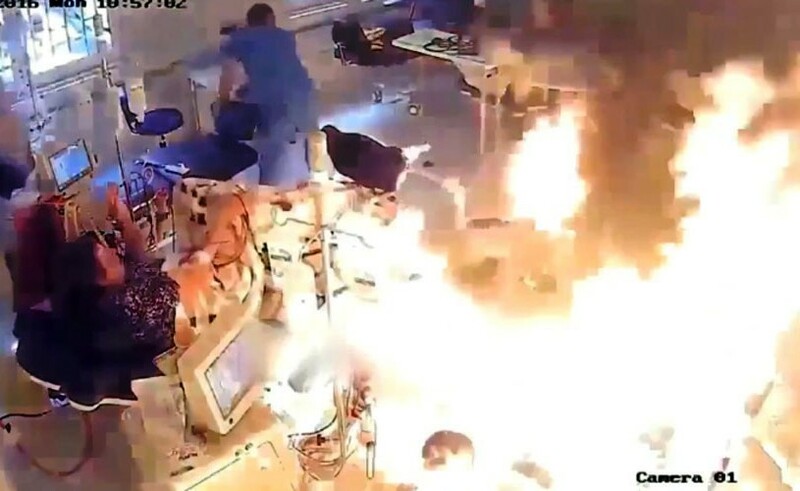 The horrific moment a man set a hospital ward ablaze in an attack on another patient, killing three including himself, has been caught on CCTV. A scuffle ensues before the perpetrator ignites the fluid, causing an explosion and engulfing the room in flames. Three people died in the inferno that was intentionally started at the American Hospital in Tirana, Monday. Two female patients, Sanije Sulaj, and Hani Mal, both aged 55, died from asphyxiation, according to Albanian news site Albeu. The target of the attack, Dashamir Saraci, was seriously injured while the arsonist, identified as Lefter Canaj, died Tuesday, according to Albanian Daily News. He had been arrested by police a few hours earlier. It’s believed Canaj carried out the attack after he had an argument earlier that day with Saraci while waiting to use the kidney dialysis machine. The hospital issued a statement on Facebook commending the actions of the nurses, who helped extinguish the fire before police and firefighters attended the scene.